Many different elements of aquarium water chemistry interact with each other. For example, alkalinity relates closely with pH, hardness and calcium ion levels. However, you don't need to worry about measuring alkalinity specifically unless you have a reef tank. In reef tanks, it's rare to have excessively high alkalinity, unless you overshoot when adding calcium supplements. In this situation, you have several options. Alkalinity is a measurement of how much a given water sample can resist the pH-dropping effects of acid. This relates closely to the water's hardness and calcium ion levels, which measure the concentrations of various minerals dissolved in the water, since these minerals buffer the water. Adding calcium to the water raises all of these levels. 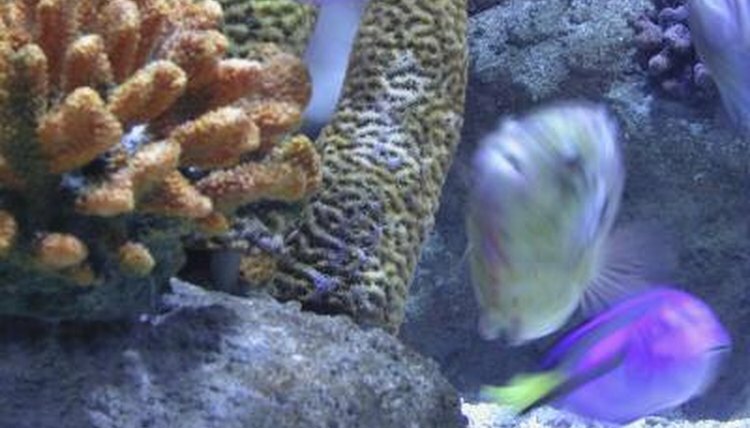 In reef aquariums, you must add calcium to the water for two reasons. First, reef organisms come from hard, alkaline water with high levels of dissolved calcium, and have adapted to these conditions. Second, these same organisms absorb calcium and other organisms to form support structures like exoskeletons, and need it replenished. The fastest, easiest way to reduce alkalinity is to dilute the aquarium water with purified, low-mineral water. Reverse-osmosis or RO units produce water with almost no dissolved minerals. You can add this water to the aquarium to water down the overly alkaline water. However, you could also lower the salinity with this method. If you need to substantially lower the alkalinity, prepare a new batch of artificial seawater with salt mix and RO water. This will help lower the alkalinity, though not as radically as you would by adding RO water directly to the tank. You need to keep several things in mind when lowering alkalinity. First, test the salinity when you do. If you dilute aquarium water, you can also reduce the salinity, possibly to dangerously low levels. Additionally, remember that fish have a hard time adapting to sudden changes in water chemistry, even changes towards optimal conditions. Never change the alkalinity so much that the pH drops by more than 0.2 a day. Changes more extreme than this can stress and possibly kill fish. Alkalinity can be measured a number of ways. Different test kits produce readings in different units. However, the ideal range for marine fish tanks in general, and reef aquariums in particular, all translate to the same range, regardless of the units. The ideal range can be write as 2.5 to 4 meq/L, 7to 11 dKH, srhort fo German carbonate hardness or 125 to 200 ppm CaCO3 equivalents. All of these units represent different ways to measure alkalinity.